It is a new year, new beginnings, new projects, and new diets! But one thing hasn't changed with the new year, my obsession with making flowers continues. I am pleased with how this one turned out. 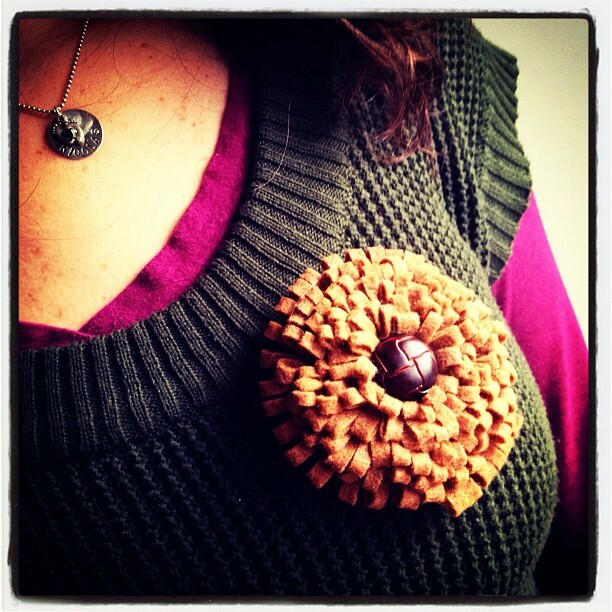 It is very easy to make and cute with all the loopty loops...enjoy! Button (preferrably a shank style about and inch round"
Cut a piece of felt 2" wide by 30" long. 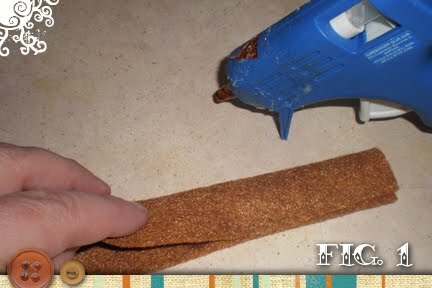 Fold the felt in half widthwise and hot glue the bottom open edge of the felt. 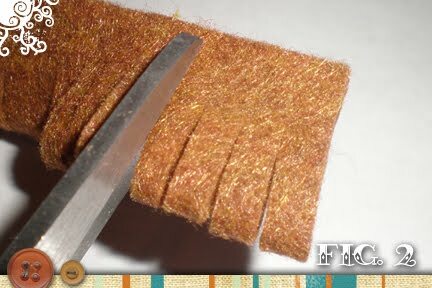 Make small cuts long the folded edge of the felt (roughly an eighth to a quarter of an inch wide). It will look like fringe. Make sure to leave about a quarter of an inch uncut along the unfolded edge. Put a line of about an inch long of hot glue along the bottom (unfolded) edge of the fringe and start to roll up the felt into a circle around itself. 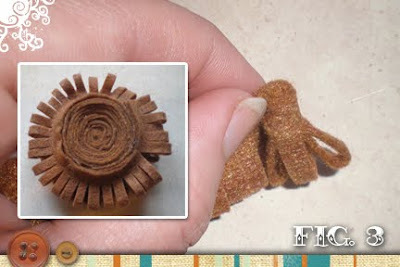 Continue gluing and rolling the fringe until the felt forms a circular shape. Push back the fringe in the center of the flower to make room for your button. Hot glue the back of the button and place it in the center. Make sure to hold it in place til the glue is cooled. Download the pattern below and cut one heart and one circle out of the felt. 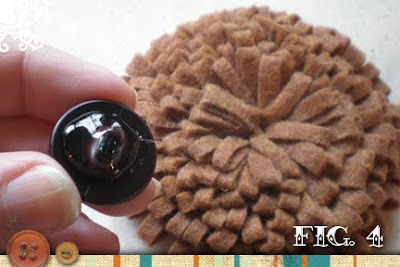 Glue the circle to the back of the flower. Glue the pin back to the center of the circle. 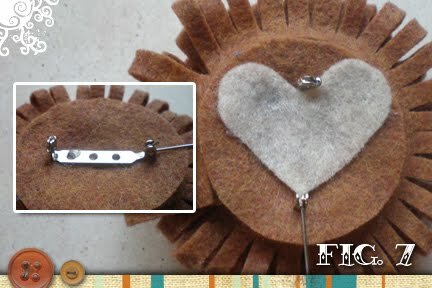 Next, glue the heart over the pin to cover up the the icky oozy glue that comes threw the holes. What a great tutorial and design! Thanks for sharing. Awesome tutorial and super cute brooch! I've got my supplies in front of me right now to make one! Thanks! great tutorial and love the look - it looks like a giant chrysanthemum - will def give it a go! very cute! this is on my to-do list now! Lovely tutorial and you make it look so simple! Kolleen, I spent almost the entire morning yesterday enjoying your blog. I have a page long list of supplies I need and the projects I want to try. My son passed away in 2010 and a friend is having a fund raiser in his memory for equipment for the recreation dept, where he played sports in our local community. I was looking for some new ideals to make for the craft/bake sale that will be in the spring. Thank you for your wonderful easy to understand tutorials. Very useful idea and beautiful directions. Just ordered some hair clips and will try these. Thanks! Thanks to everyone for the comments! Sometimes I do these things and wonder if anyone really ever makes them and now I know they do. I would love to see pictures of your flowers! Hi Kolleen!!! Beautiful blog!!! !Nice to meet you !!! Dear Kolleen, I'm so happy because find you and your ideas! I'm crazy for flowers.It's more that perfect.I am a beginner and will learn from you.Thanks!!! In October I posted a tutorial to make leather earrings. Well for Christmas I revisited this craft and made a few other designs for a few people at my work. This is one of my favorite tutorials because they are so easy to make and the earrings are light and easy to wear. I liked the new designs so much I thought I would share the pattern for them. Why should leather only be used for jackets, shoes and purses? Medium weight or upholstery leather is easy to craft since it doesn't fray or crinkle. These leather earrings are quick, versatile and easy to make. You can even recycle those old purses or jackets that have damage since you really only need small amounts of good leather. I used 4" square leather samples and had plenty left over to make more earrings. Download the pattern below, print and cut out shapes.Cut 2-of each shape in the leather of your choice. I used 3 different types of leather, don't be afraid to mix it up. Every time I buy furniture that requires assembly I always left over hardware. I take this hardware and put it in a jar thinking that one day I will need that extra nut or bolt. Well today is that day! Below is a tutorial on how to take those extra washers and make them into a cute necklace. Use the washer to trace a circle on the paper, don’t forget to trace the inside circle as well. Using your scissors cut just inside of the traced line on the outer circle. Note: you want to cut inside of the line and not on it so it fits on the washer and does not overlap the edges. If the hole for your center is close to the same size of a hole punch, simply punch out the center circle. If not use the X-acto knife to cut out the center area.